A struggling author, a famous ghost and a plot that grabs you from the get go. Jacy McMasters is a microbrewery working wannabe writer who drinks too much caffeine and alcohol. Did she just channel a dead author? Hmmm. 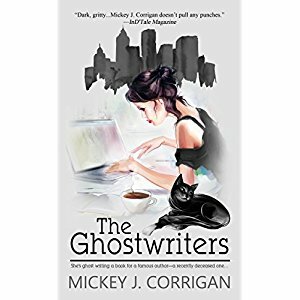 This ride into the human psyche along with some humor makes Mickey Corrigan’s book a winner. It’s a roller coaster ride about the relationships that drive Jacy McMasters to the darker places in the mind and back out to the top of the bestseller list. This is one ride you’ll want to take. Quirky, suspenseful and fun, with a little romance tossed in for good measure. Set in Manhattan, city of dreams, this is a tale of a woman haunted by her past, who avoids the reality of her dysfunctional family and history of mental illness. Jacy is on a path of self-destruction when she channels the ghost of a recently deceased author who wants her to pen the sequel to his famous novel. This will be a journey of self-discovery that will save her from herself and push her to success. I enjoyed the multi-level themes of this fast paced read. Mickey Corrigan takes us deep into the mind of mental illness, and I applaud the ride. The balance of dark humor, drama, and suspense woven into the plot will keep you engaged and wanting more. Shocked that I missed some of the punchlines, the end was a nice surprise. I really enjoyed this book, and you will too. A struggling writer living in Manhattan, Jacy McMasters is the first to admit she’s a liar and completely messed up. The recently deceased ghost of famous novelist JD Balinger asks her to “channel” a follow-up to his classic coming of age book, The Watcher in the Sky. With her new boyfriend, a bear of a man who has no patience for mind games, the ghost in Jacy’s head forces her to confront a lifetime of dark secrets that she has been keeping from herself. Please note: I received a promo copy of this book from Pump Up Your Book in exchange for an honest review.